The Japan BioPlastics Association (JBPA), formerly known as Biodegradable Plastics Society, has created the BiomassPla Identification and Labelling System to help consumers identify biomass-based plastics defined by the JBPA as “high-polymer” materials with a mean molecular weight of at least 1,000 that can be obtained through chemical or biological synthesis from raw materials that contain substances derived from renewable organic resources. Biomass-based plastics exclude chemically unmodified non-thermoplastic natural organic high-polymer materials, according to the JBPA. The ASTM D6866 version indicated in the JBPA website is ASTM D6866-05: Standard Test Methods for Determining the Biobased Content of Natural Range Materials Using Radiocarbon and Isotope Ratio Mass Spectrometry Analysis. The ASTM D6866-05 standard has been superseded by other versions. Effective March 2018, the current active version of the standard is ASTM D6866-18: Standard Test Methods for Determining the Biobased Content of Solid, Liquid, and Gaseous Samples Using Radiocarbon Analysis. The BiomassPla system, which started in July 2006, certifies products that conform to standards set by the JBPA. One standard requires products to have a “biomass-based plastic ratio” of at least 25%. The JBPA defines “biomass-based plastic ratio” as the proportion of the total weight consisting of components derived from biomass in the composition of the biomass-based plastic or biomass-derived thermosetting plastic raw material contained in the raw material and product (percentage by weight). Other standards under the BiomassPla system assess biodegradability, oral acute toxicity, and environmental safety, among others. The JBPA also provides a list of substances that must not be used as raw materials in the manufacture of biomass-based plastics and its semi-finished products. A list of registered BiomassPla products are published on the JBPA website. These registered products carry a logo with a three-year validity period. 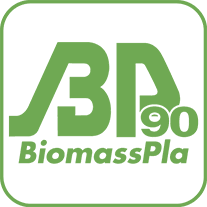 Application for product certification and approval for BiomassPla logo use is limited to members of the JBPA. Resignation from the JBPA terminates the use of the logo. Miami-based Beta Analytic is accredited by the JBPA to fulfil the ASTM D6866 testing needs of clients through its agent, Chikyu Kagaku Kenkyusho in Nagoya City, Japan. The ISO 17025-accredited and ISO 9001-conformant lab has provided ASTM D6866 testing to clients worldwide since 2004.